Sure, saving for a down payment is important, but too many home buyers get caught up in the “save, save, save” mindset, only to find themselves with a bad deal and a huge mortgage payment down the road. Why? Because they neglected their credit along the way. You see, your credit plays a huge role in the type of mortgage loan (and the mortgage rate) you can get when buying a home. While putting away a thousand a month could certainly help you put a chunk of change down up front, you might actually be better served by putting those funds toward your credit card debt, student loans, car payments or other outstanding lines of credit you have open. Run your credit report. Get your free annual credit report from Experian or Equifax, and pay the small extra fee to get access to your credit score. The minimum you’ll need to secure a mortgage loan is a score of 580, but keep in mind, the lower your score is on the spectrum, the higher mortgage rate you can expect – and that means more interest (and more money spent) in the long run. Look at your credit history. You should also look at the credit history on your report. How long have you had lines of credit open? What has your payment history been like? Lenders look for borrowers who have proven their ability to make payments reliably over time. The more you’ve paid your bills on time, the better borrower you make. Find room for improvement. If you only have one or two lines of credit, have had a spotty payment history or your credit score is low, you definitely have some room for improvement. 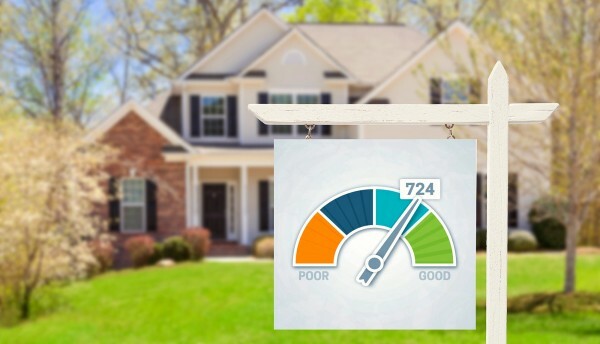 Instead of getting yourself deeper into debt with a mortgage loan now, consider how you can make your current credit report look even better. If you have a low score, work on paying down your outstanding debts and making payments on time, every time. If you’re short on lines of credit, open up a new credit card and use it for daily purchases. Then, every week, pay it off in full from your debit account. It’s a great way to boost your score and give yourself better credit history at the same time. Avoid making big purchases. The fastest way to make a bad credit situation look even worse is to make a big purchase right before you apply for a mortgage. This sends up an immediate red flag to your lender, signaling that you might be more than a little irresponsible with your money. Steer clear of any big purchases if you’re preparing to buy a home, and save big-ticket items for later, once you’re settled in at your new place. Run your credit again. Once you’ve done some work, run your credit report again (keep in mind, you will have to pay if it’s within a one-year period). Check to see how your score has improved and what your credit history looks like after putting in the time. If you’ve seen a boost in either, you’re probably safe to apply for pre-qualification, which will give you an idea of what sort of mortgage loan and rate you could currently secure. 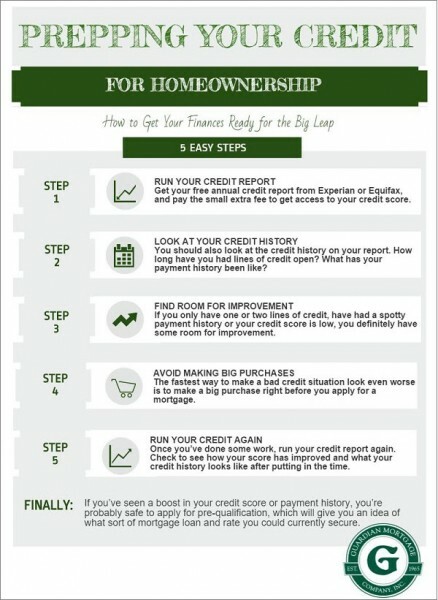 Preparing your credit for homeownership is crucial – especially if you want a great rate with a great lender. Want to know what your current credit would garner you? Contact a loan officer and apply for pre-qualification today. We’re here to help. Are US Home Mortgage Rates About to Climb? Mortgage Owners Better Refinance And Lock in While They Can. All Indicators show mortgage rates are on the rise in the United States. The rate for a 30-year fixed mortgage hit 3.48 percent yesterday on Zillow’s mortgage rate ticker, up from 3.39 percent a week ago. It was the second straight week of rising rates, Zillow reports. Zillow attributed the increase to “rumors” the Federal Reserve would begin scaling back the QE3 stimulus program sooner than expected. But Zillow predicts rates are on an extended upswing. “This coming week, we expect rates will continue a longer-term upward trend as economic data points towards continued signs of economic recovery,” Erin Lantz, director of Zillow Mortgage Marketplace, said in a statement. Zillow’s rates are based on real-time quotes submitted daily to anonymous borrowers and “reflect the most recent changes in the market,” the site claims. But Zillow is not alone in forecasting a steady rise in mortgage rates. The latest report from the Mortgage Bankers Association also shows a turnaround in rates. After months of declines, MBA shows rates bottoming out at the end of 2012 and steadily rising through 2013. Rates for a 30-year-fixed mortgage are expected to hit 3.6 percent by the end of the second quarter and rise to 4.1 percent by the end of the year. Rates will continue to rise in 2014, hitting 4.6 percent by the end of 2014, MBA forecasts. How To Get The Best Mortgage Rates. How to get the best Mortgage Rates Without a Super Impressive Financial History. How to Qualify for Really Low Mortgage Rates. Have you been thinking of buying a home or refinancing your mortgage, but wonder what it will take to qualify for those great mortgage interest rates you’ve heard touted in the press? “You’re going to have to have very good credit and a stable work history,” he says. That could start you toward getting a mortgage interest rate on a 30-year fixed rate loan that, as of September 6th, 2012, was a low 3.65 percent, according to Mortgage News Daily, an organization that provides housing news and analysis. So don’t give up just because your credit isn’t perfect. Instead, read on for details on how to qualify for the best mortgage interest rates and what to do if you don’t qualify. And if you’re wondering what very good to excellent is, Boulter says a score of 720 or above hits the mark, according to the Fair Isaac (FICO) scale, which most banks use. That scale, by the way, runs from a low of 300 to a high of 850, according to the Fair Isaac Corporation. Banks usually want to know that you can pay them every month for the money they lend you – they’re funny like that. If you can show them that you are a good risk (in other words, that you have an adequate income to pay your bills, including your mortgage), you’re in a better position to get a favorable rate, says Boulter. “The top two priorities for the most favorable rate is your ability to show very good to outstanding credit and your ability to make the monthly payment,” he says. Also, don’t forget that your new mortgage payment also counts as a liability included in that 40 percent. So if you want to qualify but are over the 40 percent threshold, try to reduce your liability by paying off credit cards or other loans. It’s no secret that many people have had disruptions in their employment in recent years. But if you’re fortunate enough to have had a steady job history, you could save money in the form of a low mortgage interest rate. 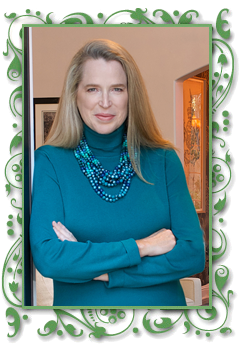 “You typically need to have two years in the same job or at least in the same industry. And that’s two consecutive years,” says Boulter. He says that if you have been laid off or had a period of unemployment in the past two years, your chances of qualifying for the lowest rates are unlikely. That’s because lenders are more wary than ever before when it comes to risk. In fact, due to the challenging economy, banks have restricted loans to those who have a longstanding and steady income stream, says Boulter. “It’s tough, but that’s today’s reality,” he says. But what if you don’t have a stable job history? There is still hope, says Boulter. You could qualify for a government subsidized program, such as a Federal Housing Authority (FHA) loan. These loans, designed for low-income households, typically carry a rate that’s about one percent higher than the lowest current rate offered by commercial lenders. What’s more, these loans feature benefits like low down payments and easy credit qualifying, according to the U.S. Department of Housing and Urban Development, a government institution that works to strengthen the housing market. Have you followed your parent’s advice and been a responsible saver, saving a little cash for a rainy day? Well, if it’s not currently raining, your savings could help you qualify for a good mortgage rate. Boulter says that if you can prove you have adequate assets, the bank will be more willing to give you a good interest rate on your mortgage. The best asset is, of course, a savings account with cash, but other types of assets – or reserves – are things that can be easily cashed out, such as retirement accounts or pensions. “Typically speaking, they want to see that you have a minimum of six months reserves that you can verify before they’ll consider approving your loan,” says Boulter. Those reserves have to be enough to pay all your liabilities, including your mortgage. “They’re looking at your ability to keep yourself afloat should you hit rough water,” he adds. Rough water could be losing your job or anything that hinders your income. Remember, the bank is funny about wanting to be paid back, so they need a guarantee that you can still pay them if you are unemployed for months on end. Basically, plan for the rainy day scenario. Is your home equity worth at least 20 percent more than the amount for which you want to refinance? Because that’s what lenders will want to see in order to offer you the best rates, says Boulter. Why? Because of that magic “risk” word again. You see, the difference between the market value of your home and the amount you still owe on your mortgage is called equity, and when your home loses value, your equity is the first to take a hit. But once your mortgage amount is more than the market value, your lender is in danger of losing money. And here’s a news flash: Banks don’t like to lose money. So if you don’t have 20 percent equity, but want to refinance, Boulter says taking money out of other investments that are not earning decent returns could be a way to bolster your equity. 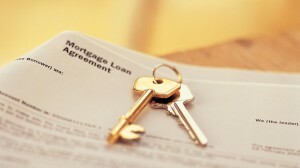 By reinvesting that money into your home, you might then be qualified to refinance at a better mortgage interest rate. It’s important to make sure this will work for you financially, however. You may want an accountant or other money management professional to advise you, he says, since this is a big decision that could have long-term consequences. After all, that’s sort of why you’re doing it. ulter adds that if you don’t qualify for the lowest rates, you could still qualify for rates that are typically a percentage point higher, which is still very good, historically speaking.